Sometimes, I notice that I don’t look anymore at certain < 1000 USD (or 750 Euro) watches. Not that I think they aren’t properly made or that these watches are inferior to what is in my collection already, but I just overlook them. Aside from being in the credit crisis and bonuses aren’t being spend on expensive watches, I think some of these < 1000 USD watches can be mighty interesting. For both the starting and the advanced collector. Like one of my watch friends recently said, it is very easy to be critical (or negative) towards the quality of cheaper watches, but look at it this way: it is quite charming to get a watch that you know of that it could be done better, but not for this kind of money or not by the people behind it. They did the best thing they could do (in their powers) to create a watch, and for this kind of money. First of this top 5 is a watch that was introduced to me by HorlogeNieuws.nl, a Dutch website for watch adepts. 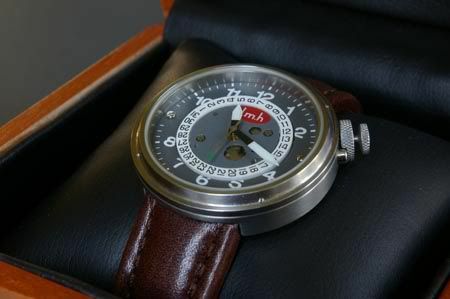 DMH stands for Dingemans Mechanische Horloges, which is Dutch for Dingemans Mechanical Watches. This one-man show is the work of Fred Dingemans, he works from his home in a small village in The Netherlands. He uses all kind of tools, but makes sure he does as much by himself as possible. Only 12 pieces per year and approximately 800 euro. A bit above budget perhaps, but it also depends how the USD>EUR conversion is today 😉 Not a lot of money for a hand crafted watch like this, using a mechnical Swiss movement, original design and produced in very limited numbers. This 720 Euro Sinn 656 is a serious option for both serious collectors as the starting collector. Or the guy that just wants one decent watch for a very fair price. It has an ETA 2824-2 movement, a very legible dial, a date feature and a nice soft leather strap. 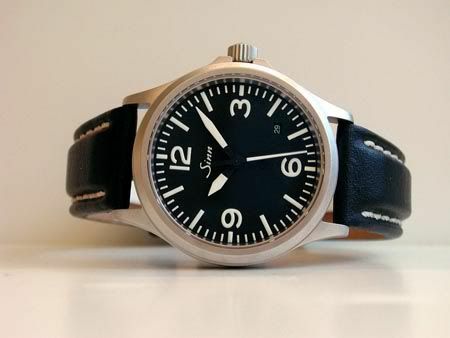 I have written a lot about Sinn in the past and at one point, I even owned one (the ST142St.S). Sinn is a relative small watch manufacturer from Frankfurt am Main in Germany, creating highly functional watches. Function over form, so to speak. The 656 is highly anti-magnetic (80.000 m/A), has a sand blasted case, sapphire crystal and comes with either a leather strap or stainless steel bracelet. The picture is from Horloge Platform Nederland btw. Another watch from our German watch friends, who are especially known for two of their models. The Mega1 radio controlled wrist watch and the Max Bill watch. 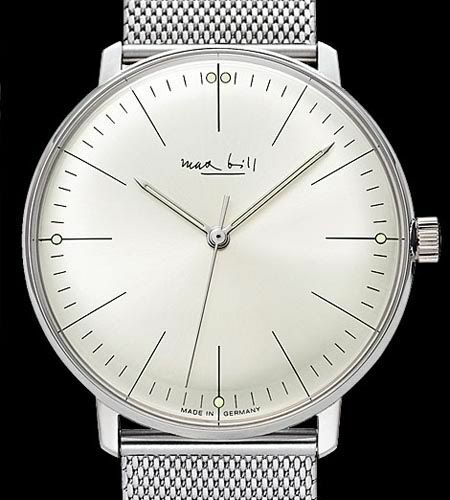 Max Bill was a designer (Bauhaus) and designed a bauhaus style watch for Junghans (since 1861) in 1962. Lately, Junghans has been re-releasing this watch up to current standards. The 38mm automatic version is 695 Euro and comes on a mesh bracelet. This is a typical watch that works for almost anyone who is in the need of a classic time piece. Loyal readers might recognize this picture, as I have been blogging about it before (click here for the coverage on this watch). Stowa is owned by Jorg Schauer, known for the time pieces made under his own name. For 590 Euro (approximately 780 USD), you can have this original flieger uhr (pilot’s watch). No branding on the dial, as legible as it can come, automatic ETA 2824-2 movement (same as the Sinn 656), blued hands and a 40mm watch case. This size is considered to be the maximum again by some watch fans. 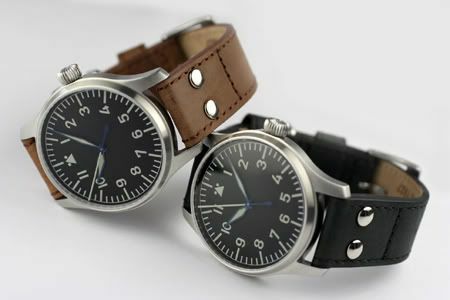 This watch can be ordered directly from the Stowa website. A watch like this is probably not for everyone (including me), but I know for sure that a lot of you will like the ‘raw’ flieger thing. I am not joking. For less than 200 USD, you are the owner of this Seiko Monster watch. It is a respected watch amongst divers and collectors, water resistant to 200 meters, has an inhouse automatic movement (caliber 7S26, for what it is worth), 42mm in diameter and for a few bucks extra, you can attach a rubber strap to it as well. I’ll be the first one to admit that this is a bit of a strange choice, but it is here to show you that even for as little money as 200 USD you can have a nice (and original) automatic time piece of great quality. Although I think the bracelet might be a bit sharp edged, with a rubber strap it should be comfortable. The production of this watch started in 2000, and its name ‘Monster’ is of course not official. Officially, Seiko just uses the SKX781 reference. The stainless steel bracelet has a diver’s extension, which is there to use with a diving suit. The mechanical movement is automatic, and the strange thing is, it doesn’t handwind. You really have to ‘use’ the rotor to wind it. To sum it up, these are 5 more or less ‘unique’ (each in its own way) time pieces that can be had for less than 1000 USD. Of course, there are a lot more, and my top 5 will probably change along the way. But for now, I definately would choose from these 5, probably number 1 (DMH) or 2 (Sinn 656). What would be your top 5 of < 1000 USD watches? Leave your ideas in the comments!